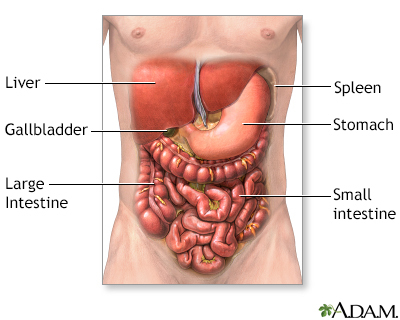 Surgery that opens the abdomen is called a laparotomy. 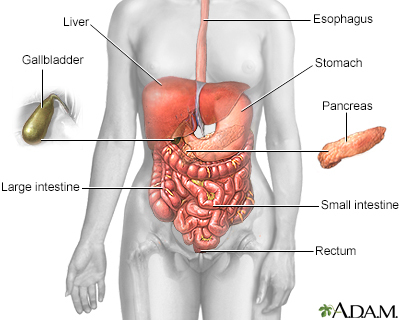 The abdomen contains many vital organs: the stomach, the small intestine (jejunum and ileum), the large intestine (colon), the liver, the spleen, the gallbladder, the pancreas, the uterus, the fallopian tubes, the ovaries, the kidneys, the ureters, the bladder, and many blood vessels (arteries and veins). Exploratory laparotomy is done while you are under general anesthesia. This means you are asleep and feel no pain. The surgeon makes a cut into the abdomen and examines the abdominal organs. The size and location of the surgical cut depends on the specific health concern. A biopsy can be taken during the procedure. Laparoscopy describes a procedure that is performed with a tiny camera placed inside the abdomen. If possible, laparoscopy will be done instead of laparotomy. Your health care provider may recommend a laparatomy if imaging tests of the abdomen, such as x-rays and CT scans, have not provided an accurate diagnosis. Do a complete physical exam. Make sure other medical conditions you may have, such as diabetes, high blood pressure, or heart or lung problems are under control. Perform tests to make sure that you will be able to tolerate the surgery. If you are a smoker, you should stop smoking several weeks before your surgery. Ask your provider for help. What medicines, vitamins, herbs, and other supplements you are taking, even ones you bought without a prescription. You may be asked to temporarily stop taking blood thinners. Some of these are aspirin, ibuprofen (Advil, Motrin), vitamin E, warfarin (Coumadin), clopidogrel (Plavix), or ticlopidine (Ticlid). Prepare your home for your return from the hospital. Take medicines your provider told you to take with a small sip of water. You should be able to start eating and drinking normally about 2 to 3 days after the surgery. How long you stay in the hospital depends on the severity of the problem. Complete recovery usually takes about 4 weeks.